For over 45 years, General Digital Corporation has served a variety of markets through innovative design and implementation. Today, we continue to serve the marketplace with advanced design and engineering capabilities as evidenced in our diverse line of LCD monitors and associated hardware products, display enhancements, contract manufacturing, and software engineering services. The paragraphs that follow serve to illustrate the vast resources at our disposal to provide products and services that meet the needs of our diverse customer base. Download our Company Capabilities brochure. Our engineering prowess is second to none. From Electrical engineering to Mechanical Engineering, from Compliance Engineering to Testing & Qualification, our talented workforce possesses the experience and expertise to design systems and applications tailored to meet your specific requirements. 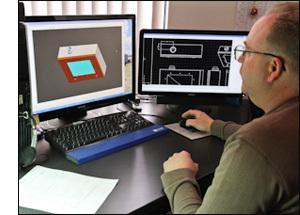 General Digital has an intimate familiarity with industry and military design requirements and standards. Touch screens, vandal shields, polarizers and optical films are just some of the many options our Optical Bonding Laboratories utilize to provide the latest and most effective display enhancements. Many of our customers find themselves faced with meeting strict military, industrial, or harsh environmental requirements. In response to these challenging needs, General Digital provides on-site testing and characterization services. Shock, vibration, barge test, etc. Specializing in testing safety critical embedded software for over 25 years, General Digital Software Services has extensive experience providing customers with an accurate assessment of software deficiencies early in the development life cycle. This translates into a cost efficient high quality result, which means less engineering oversight on your part. MIL-STD-3009, DEPARTMENT OF DEFENSE INTERFACE STANDARD: LIGHTING, AIRCRAFT, NIGHT VISION IMAGING SYSTEM (NVIS) COMPATIBLE (2 FEB 2001) [SUPERSEDING MIL-L-85762A]., This standard establishes requirements for the emission characteristics of aircraft lighting and display equipment that is intended for use with night vision imaging systems (NVIS). It is applicable to all systems, subsystems, component equipment, and hardware that provide the lighting environment on aircraft where NVIS are employed. This document is applicable to NVIS specific performance requirements but it does not contain general lighting requirements. The contracting activity should extract and tailor applicable general lighting requirements from JSSG-2010-5 and include those requirements in the contract. To our valued customers, our highly trained and tenured production staff delivers quality and reliability in every product. In addition, as a full contract manufacturing service, we can perform as little or as much servicing as required, while providing progressive advice and engineering expertise for continued innovation and evolution of your equipment. General Digital encourages relationships with Original Equipment Manufacturers (OEMs) and other organizations in a broad range of markets and industries. The complete solutions that we provide help many of our customers by alleviating their inventory burden and increasing their asset flexibility. From turnkey display systems to customized electronic devices, our rugged and specialized products will meet the demanding needs of any environment, no matter how harsh or unique it may be. General Digital will maintain your company's authoritative identity and brand with your private label on our dependable products. Our reputation is built on the products and services we provide. For this reason, quality control inspection is performed on 100% of products we manufacture, not just on a sample lot.